viaLibri ~ History of Western Philosophy. London: George Allen and Unwin Ltd,, 1946. And its connection with political and social circumstances from the earliest times to the present day. Octavo. Original grey cloth, spine lettered in yellow on a brown background. With the dust jacket. A very good copy in the dust jacket, slightly nicked, slightly creased at extremities, rear panel lightly soiled, short closed tear to head of front panel and foot of front panel fold, small chip on each flap fold. First UK edition, first impression. 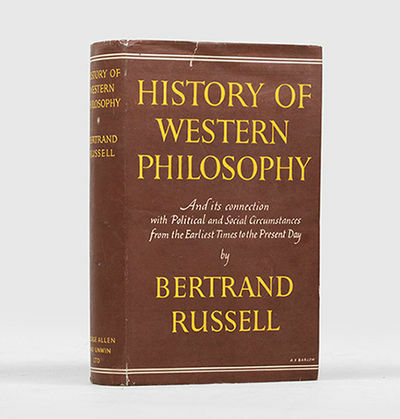 Russell's compendious account of the history of philosophy, from the Orphism of Ancient Greece to the Logical Positivism of the author's present day, was a triumph of his populist craft and is perhaps his most famous book. Written during the Second World War, Russell's project was in part conceived to explain to his audience the exact nature of the "civilisation" for which they were fighting. Appropriately, the dust jackets were printed on the backs of surplus Second World War maps, this one showing a part of what is now the Czech Republic. Simon & Schuster published the first US edition in the preceding year.